In my continuing quest to become more educated about the food I consume, I became interested in buying more fresh produce locally. I began looking for farmers' markets and discovered the website for Slow Food Pittsburgh. They offer a completely organic farmers' market every Saturday from 9AM-1PM known as the Farmers@Firehouse due to its location at The Firehouse Lounge in the Strip. The weekend is a more flexible time for me to get my shopping done, since I work long hours during the week and can't make it to most farmers' markets as they seem to be during the afternoon on weekdays. In addition to the convenient time, I was also attracted to the fact that this farmers' market offered only organic produce. Enough chit-chat, let's get to the goods. Here was my haul (Figure 1) for this week: hens' eggs, proscuitto and Crested Duck black hawaiian sea salt from The Farmer's Wife; kale, swiss chard and zucchini from Mott Family Farm; hydroponic tomatoes from Pucker Brush Farm out of Shelocta, PA; quails' eggs from Blackberry Meadows; and spring onions, broccoli and peas from Blue Goose Farm. 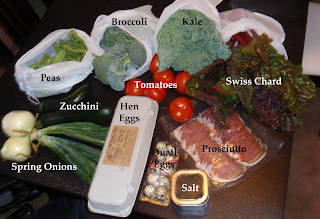 Figure 1: Organic produce from Farmers@Firehouse on July 9, 2011. I was so taken with the fresh eggs that I had to share a photo of them as well (Figure 2). There were jumbo eggs or unclassified for sale. I went for the unclassified and I'm glad I did. 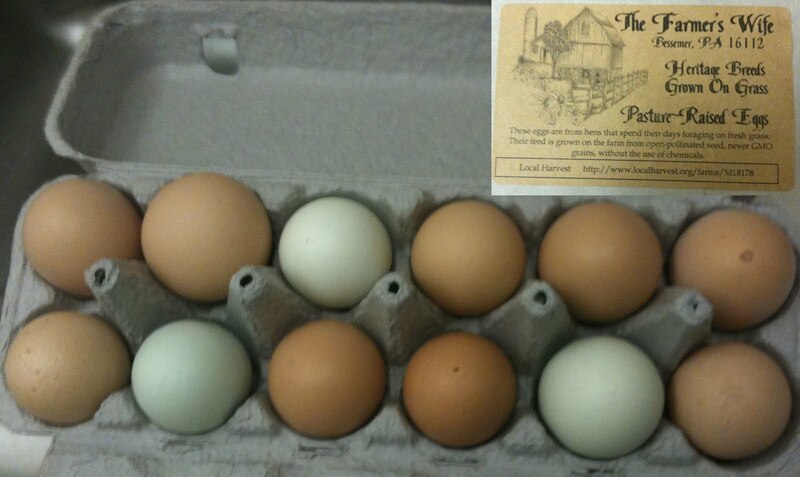 I was so happy when I opened the box and saw an array of differently colored eggs of varying sizes. Also, when I cracked a couple to make scrambled eggs, the yolks were a rich orange-yellow color and so delicious. Figure 2: Fresh eggs from The Farmer's Wife. The inserted label states that these eggs are from hens that spend their days foraging on fresh grass :) I particularly love the pale blue eggs! Finally, since I was already in the Strip for the farmers' market, I stopped off at Wholey's Fish Market to pick up some sustainable fish options. I found some fillets of wild-caught Alaskan sockeye salmon and whole dressed rainbow trout. I learned my lesson from past experience and had the fishmonger chop the heads off the trout for me this time. All in all, a successful trip and I can't wait to start cooking! I didn't know you were altereggo! I like all of your local buys!